By setting up the release module, end users are able to securely print confidential or sensitive material while they are standing at the physical printer. There are two parts to the Pull Printing Module. Secure Printing - The ability to print to and securely release from a specific printer. Pull Printing - The ability to print and securely release from any printer in your environment. Select Tools > Settings > Printing. In the "Pull Printing" section, check Enable Workstation Pull Printing / Secure Printing. You will now be able to designate printers for secure release and setup the pull print queue. No - Not a secure release printer. Any print jobs sent to this printer will be printed as normal. Yes (always) - Sets the printer as secure release, but does not offer a prompt when printing. All jobs are held until they are released. Allow End-Users to Override - This allows the end user to specify the secure release settings for this printer. Create a new TCP/IP printer on the root or in the folder of your choice. In the Printer Name field, give the printer an appropriate name signifying it as the pull printer. Check the box labeled Make Pull Printer. Select or upload the drivers to be used for the pull printer. Install the new pull printer by deployment assignment, or self service portal page. Use Global - Configured in Tools > Settings > General. Use Printer Specific - Configured from general tab. Allow Pull Print Jobs to be released to this printer. Direct access - Add "/release" to the URL from the self-service portal page. System tray icon - Right click Client Icon > Release Print > Print job Management. Start menu - Start > All Programs > Printer Installer > Print Job Management. This can be a PC or tablet locked down or in kiosk mode and set to only display the release portal. The release station will only be allowed to release print jobs to printers that are associated with it and will log the user out after 15 seconds of inactivity. Once logged in with your Active Directory credentials, you will be shown your pull print and secure print jobs waiting to be released. If the server hosting Printer Installer goes offline, the local release portal is activated on the end user workstations. To access the local release portal right click the client icon in the system tray and select Release Print > Print Job Management. 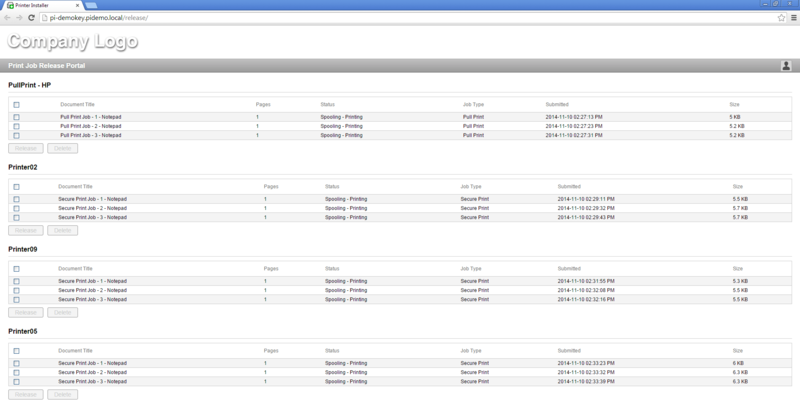 From the local release portal you can select your secure and pull print jobs and release them to the selected printer. Requirements: Currently the app is supported on specified HP and Xerox models of MFPs. Log into the administrator console and select the printer to install the app on. In the General tab, go to the "Pull Printing: Control Panel Application" section and select Use printer-specific administration credentials. Enter the administrator username and password for the printer. If a badge reader is attached to the printer, select Enable badge authentication. Click Install Application on Printer. Once the spinning circle disappears, the app is installed on the printer. When a user taps on the app icon, the app will load. The user will be able to authenticate using their AD credentials. If badge authentication is enabled, they will also have the option to log in by swiping their badge. If the user's badge has not yet been registered, the user will be prompted to log in with their AD credentials to register the badge.